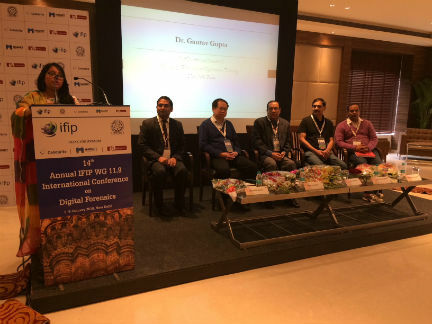 New Delhi: The Indian Institute of Technology Ropar (IIT Ropar) in collaboration with University of Tulsa, USA, organized the 14th Annual IFIP WG 11.9 International Conference on Digital Forensics from 3rd – 5th January 2018 at Lalit Hotel, New Delhi. The three-day conference witnessed an overwhelming participation from law enforcement agencies, central as well as state forensic science laboratories, academia, and the industry from all over India. Leading researchers, academicians & technical minds from top universities, forensic lab have suggested new technical solutions for efficient and scalable solutions to solve cases of computer frauds cybercrimes. The techniques and hand on solutions were demonstrated in the areas of mobile, cloud, network, embedded device forensics, IoT and biometrics. The work on detecting source of hard copy document was presented which is unique and need of the hour for the communications of confidential information; especially among Government communications involving VIPs. The work compromises of next generation forensics using Artificial Intelligence & machine learning techniques. This work makes significant contribution to advancements of digital forensics & challenges researchers to push boundaries of technology. On third day of the Conference, there was a special session held especially for law enforcement agencies. Dr. Somitra Kr Sanadhya, the Organizing Chair of the Conference and Associate Professor, Dept. 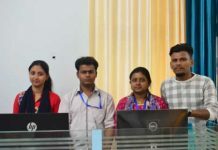 of CSE, IIT Ropar, expressed his happiness on IFIP WG 11.9 committee’s decision on providing India the opportunity to host the upcoming 16th IFIP WG 11.9 International Conference on Digital Forensics in 2020.